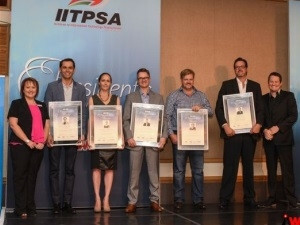 Engen's Peter du Plooy walked away with the Visionary CIO title for 2015, and Vumatel's Niel Schoeman scooped the coveted IT Personality award in this year's IITPSA President's Awards competition. 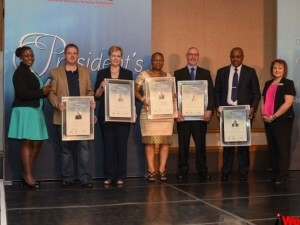 The winners were announced at the Institute of Information Technology Professionals South Africa (IITPSA) President's Awards, held at the Hilton Hotel, in Sandton, on 12 November. 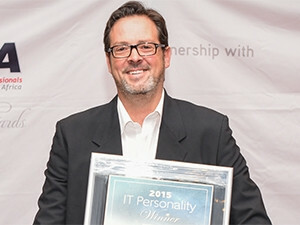 Both awards are presented by the IITPSA, in association with ITWeb, the Gordon Institute of Business Science, and Gartner Africa. In his welcome address, Tony Parry, CEO of the IITPSA, said the IITPSA is celebrating 58 years of proudly South African service to its members. "The institute is the third oldest body of its type, with 6 000 members. Today's awards are the longest standing and most prestigious IT awards in South Africa, and are about promoting excellence and promoting local IT professionals for their outstanding contributions both to the industry and our profession." Representing the event sponsor, Telkom Business' Arnold van Huyssteen, managing executive, Telkom Enterprise Product House, highlighted the reasons why Telkom Business supports achievements and recognitions within the ICT industry: "Recognition by industry peers for excellence around the areas of entrepreneurship, developing skills, and aiding local communities are what make individuals in this industry stand out." Van Huyssteen believes a "digital tsunami" is on the way, and the industry had better be ready. "If we serve end-users directly, or even if we serve our customers who serve their customers, we need to ensure we serve them in a way that they are ready for this tsunami. This will cut across the entire value chain in the IT industry ? connectivity all the way through to hosting facilities, applications and even end-user devices. It will have to come together." Ulandi Exner, IITPSA president, said the industry needs to ensure its ICT practitioners have an adequate level of knowledge and abide by a code of ethics, which is core to being part of a professional body. "The industry needs to promote its status as a profession. We have a long way to go before we reach the professional standards of doctors and engineers," she added. Keynote speaker at the awards, Anton Musgrave, business strategist and futurist at FutureWorld International, said: "When we think about the world at the moment, to me it's the perfect storm, because the environment is forcing businesses and leaders to think differently. Trust, which holds everything together, is fundamentally broken, with new scandals hitting the news on a regular basis. What is wrong with leaders in the world? Why can't we trust them, whether government, church or business? "There is also a technology tsunami hitting the industry, and an explosion of new, different and rude competitors ? young entrepreneurs intent on destroying the current system by breaking all the rules." "Our clients are changing too, and it's difficult for us to respond at the pace that customers are changing... If you don't have a strategy for a radically different world, you will be passed by. We have to think profoundly differently," said Musgrave. 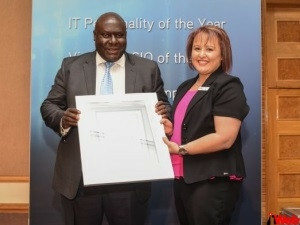 Fellowship of the Institute Award, given in recognition of an individual who has made an extraordinary contribution to the institute or the profession as a whole, was awarded to Dr Rabelani Dagada, a previous winner of the Visionary CIO award, and deputy director of University Teaching and Learning Development at Unisa. 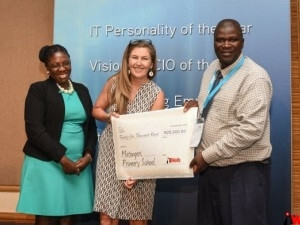 The Distinguished Service in ICT Award, given by IITPSA in association with EngineerIT, for outstanding contribution to the IT industry and the community at large, was awarded to Dr Jill Sawers, who has contributed to the growth of SMEs in SA for almost two decades. 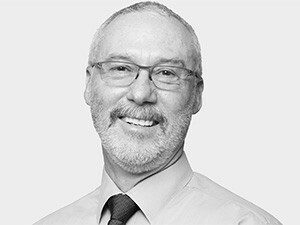 Sawers has had roles with the National Research Foundation and The Innovation Hub, and is currently CEO of Axess Consulting. The Visionary CIO 2015, Engen's Peter du Plooy, was announced by last year's winner, Financial Services Board CIO, Tshifhiwa Ramuthaga. "The call of action today is how we build a country of future relevance," she said. "The digital divide keeps on getting bigger and bigger, though, but being part of the judging panel made me realise there are amazing people doing what they can to boost the industry, skills and the country as a whole." The judges said Du Plooy exudes understated brilliance. "He is a visionary not only for his thorough understanding of how to align technology with business, but for his active approach to developing skills and capacity for the sector." "I am humbled by this award," said Du Plooy. "I would like to thank the institute and those involved in the process, those who supported me, and my organisation. I look forward to getting more involved in ICT and making a bigger contribution to the industry going forward, and to our absolutely wonderful country." Last year's winner, Gian Visser, CEO of Afrihost, who presented the IT Personality award this year, said: "This award has meant a lot. It began when I was three years old; and then when I started Afrihost in my mum's house, there were individuals that I perceived as titans of the industry winning this award. It is surreal to win it and a real honour, as well as a humbling experience." Visser handed the baton to this year's winner, Niel Schoeman, CEO and founder of Vumatel. According to the judges: "The work that Vumatel has done in creating 'fibrehoods' in Johannesburg has been transformational and required socialising the concept with the communities, which have now fully bought into it. He believes South Africans should 'complain less and do more' - and what an inspirational and fine example of that philosophy he is," the judges concluded. On receiving his award, Schoeman said: "It's an individual award but a team sport and I've been supported by a wonderful team, both at home and at work. To my Vumatel team, you are doing a fantastic job. What a wonderful time we live in in IT. What is wonderful, in my view, is we can apply IT to shift businesses and transform the world. I think SA is one of the most interesting places to be at the moment." Matangari Primary - a Limpopo school where Ramuthaga's journey began - was announced as the beneficiary of a portion of the event proceeds. A total of R25 000 was donated to the school in order to build a library. In addition, everyone who attended this year's event brought with them a book to donate, or bought a book at the Exclusive Books pop-up store, for donation to the school's library. Attendees were also asked to register their interest in taking part in the ITWeb Brainstorm Isibani skills development and mentorship initiative, where mentees are connected with industry mentors. The event hosted an array of leaders and entrepreneurs, who no doubt inspired participants to contemplate their roles and contribution to the industry and the broader community.